Treat your hair to the multiple benefits of HAIRFINITY Nourishing Botanical Oil, a versatile hair elixir that works to restore vitality, moisture and strength. Formulated from 100% naturally derived ingredients, the botanical treatment combines a cocktail of powerful oils, including Coconut, Sweet Almond, Jojoba and Moringa, and utilises an exclusive Capilsana® Complex that delivers a unique blend of bioactive Hydrolyzed Collagen to strengthen and revitalise hair; it provides naturally occurring building blocks for healthier, more resilient locks that are less prone to breakage. Penetrating the scalp and hair, the oil blend helps to seal in moisture whilst taming frizz and supporting hair health from root to tip. Infused with a calming fragrance powered by essential oils. Formulated with 100% naturally derived ingredients. Apply to wet or dry hair as needed. 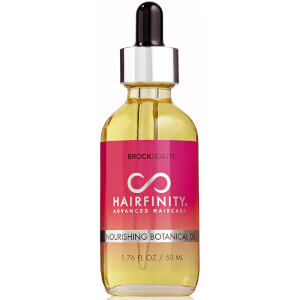 Use 1-3 drops daily on the length of the hair, focusing on the ends. As a scalp treatment, apply a small amount directly onto the scalp and massage gently until absorbed. As a pre-shampoo treatment, apply a small amount to hair, comb through, cover and apply heat for 10 – 15 minutes OR allow to remain in hair for at least 30 minutes, then shampoo as normal with HAIRFINITY Gentle Cleanse Shampoo. Caprylic/Capric Triglyceride (Coconut Oil), Vitis Vinifera Seed (Grapeseed) Oil Simmondsia Chinensis Seed (Jojoba) Oil, Prunus Amygdalus Dulcis (Sweet Almond) Oil, Organic Lavandula Angustifolia (Lavender) Oil, Thuja Occidentalis Leaf Oil (Thuja Essential Oil), Organic Cinnamomum Zeylanicum Bark (Cinnamon) Oil, Rosmarinus Officinalis (Rosemary) Leaf Oil, Thymus Vulgaris Flower/Leaf (Thyme) Oil, Organic Mentha Piperita (Peppermint) Oil, Olea Europaea Fruit (Olive) Oil, Oryza Sativa Bran (Rice Bran) Extract, Rosmarinus Officinalis Leaf (Rosemary) Extract, Helianthus Annuus Extract, Tocopherol (Vitamin E), Prunus Armeniaca (Apricot) Kernel Oil, Moringa Oleifera (Moringa) Seed Oil, Equisetum Arvense (Horsetail) Extract, Hydrolyzed Collagen.